French President Emmanuel Macron has played down fears of new barriers for Britons if there is no EU deal on Brexit, but he did not rule out visas. UK citizens currently enjoy visa-free travel in the EU, but that could change with Brexit. The UK is set to leave the 28-nation bloc on 29 March 2019. Mr Macron said suggestions that UK visitors to France might be denied visas were “fake news”. “We will not stop visas for UK people in case of no deal,” he said. Measures would be taken to cover flights, ferries and businesses as well, he added. A draft law has been tabled in the upper house of the French parliament that will let the government set new rules for Britons visiting France after Brexit. The draft suggests they will be treated as “third country” visitors – a similar category to Americans or Chinese. The preamble of the bill raises the possibility that visas may be imposed, for UK tourists and Britons living in France. The BBC’s Gavin Lee asked Mr Macron about the visa issue at the end of an EU summit in Brussels, where leaders failed to achieve a breakthrough on Brexit. A deal remains elusive mainly because of wrangling over the future Northern Ireland border. Brexit risks reinstating physical controls at the border, which were scrapped under the Northern Ireland peace settlement. The current Brexit plan is for a transition period of 21 months from the end of March, to smooth the UK’s path to a future relationship outside the EU. Prime Minister May said that transition could be extended “for a few months”, if needed. But some Brexit campaigners have reacted angrily to the suggestion. “I do prefer a deal and I want a deal, but I will never favour a bad deal,” Mr Macron said. Some British press reports earlier warned that France would demand visas for British visitors in the event of a no-deal Brexit. 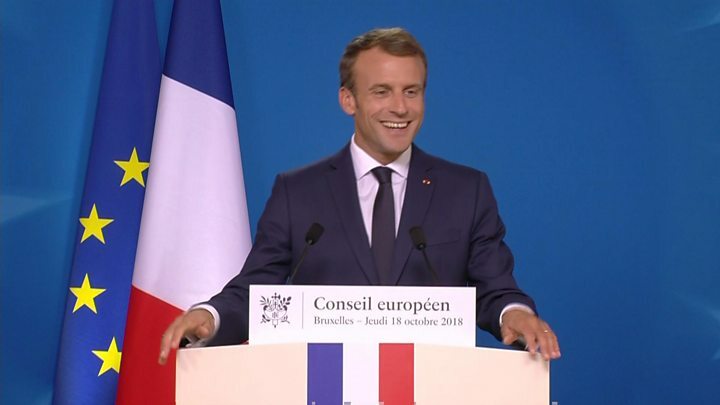 Mr Macron described the “dynamic” of the Brexit negotiations as “positive because there is a willingness on the British side to find a solution”. He said “now it’s for Prime Minister [Theresa] May to propose a solution, but we will not compromise on the key elements of the mandate we gave to [EU negotiator] Michel Barnier”. The French president also denied suggestions that the UK prime minister had been snubbed late on Wednesday, when four EU leaders went out for a drink in the Grand Place in the centre of Brussels. He told the BBC that Theresa May had left the summit earlier, and said she would certainly be invited in future. “I am always happy and open to share a drink with the different leaders, so obviously Theresa May will be very much welcome,” he said.